Home Politics I WILL CONTINUE TO CRITICIZE MUHAMMADU BUHARI, AS THERE IS NOTHING PERSONAL IN MY CRITICISMS – Chief Olusegun Obasanjo. I WILL CONTINUE TO CRITICIZE MUHAMMADU BUHARI, AS THERE IS NOTHING PERSONAL IN MY CRITICISMS – Chief Olusegun Obasanjo. Former President Olusegun Obasanjo broke his silence Tuesday since President Muhammadu Buhari’s re-election last week, by saying he will continue to criticise him. The former leader who had campaigned against Buhari’s re-election by raising a Third Force and a Coalition group, before finally settling for Abubakar Atiku, spoke at an event marking his 82nd birthday. The event took place at Olusegun Obasanjo Presidential Library in Abeokuta. 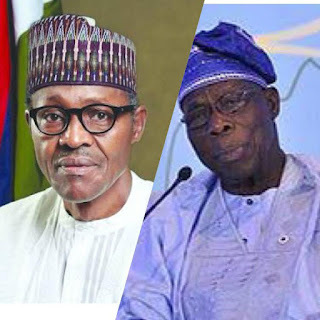 His comment followed an advice by the Alake and Paramount Ruler of Egbaland, Oba Aremu Gbadebo that Obasanjo should stop his attacks on President Muhammadu Buhari.